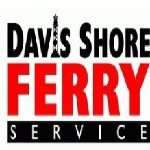 Davis Shore Ferry Service, Davis, United States - Ferry Service in Davis, NC. Davis Shore Ferry Service - Ferry Service in Davis, NC. The Davis Shore Ferry Service, Davis, North Carolina has their own tackle for lifting vehicles and other heavy objects to be taken to the other side using their ferry service.